Julian Price had finally gotten up the gumption to come home. The tall, quiet man had left his birth state of NC 20 years before to get away from people who knew about his inherited wealth. So in 1989 he took a road trip through the state. Halfway through, he strolled through the small, neatly manicured New Bern, NC and put down a deposit to buy a condominium there. Later in that same journey, he rolled into Asheville and parked the car on Haywood Avenue in front of some vacant stores. As he turned to walk down Walnut Street, he stood between two splendid but boarded up buildings and gazed at Beaucatcher Mountain in the distance. Ineffable emotion flooded him. He didn’t understand it, but decided then to forfeit his New Bern downpayment, and move to the scruffy Asheville instead. It was early 1990. 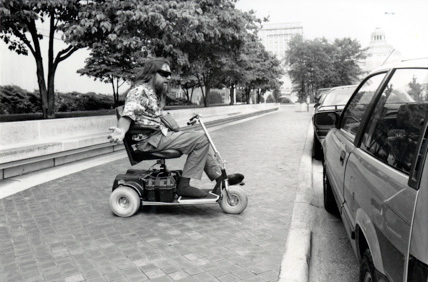 Julian saw ailing trees, unreliable trash pickup, unwelcome noise, and so many places dangerous for pedestrians and wheelchairs that he decided that would be his first focus. Indeed, no one acted on Julian’s recommendations. Julian then wrote dozens of letters, follow-up letters, faxes and calls to city staff and City Council. In the first year his letters were polite, and included gracious thank you letters whenever any tiny thing was fixed. But there continued to be little and often no response from city staff. Julian was disheartened. A naturally private and tender-hearted person, he had for years considered himself to not have good “stick-to-itiveness,” as he called it. Sometimes he thought he’d give up on his urge to make a difference in his new home town. But then he would call his fellow activist buddy, Monroe Gilmour, a great listener and cheerleader for Julian. Or he’d talk to Meg, Pat or Karen at Public Interest Projects, or others in his small but growing circle of friends. 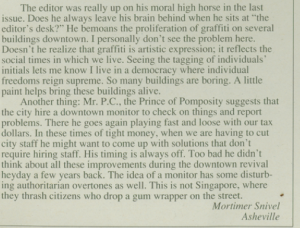 Then he’d get an idea for another approach or he would see another problem area downtown, and could get going again. Julian also called people he had met at pedestrian and urban livability conferences for how to get positive action in Asheville. 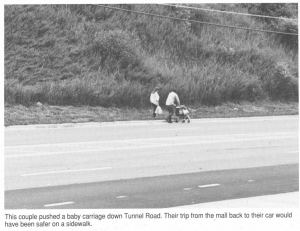 One was Kit Keller, a consultant for the Pedestrian Federation of America. 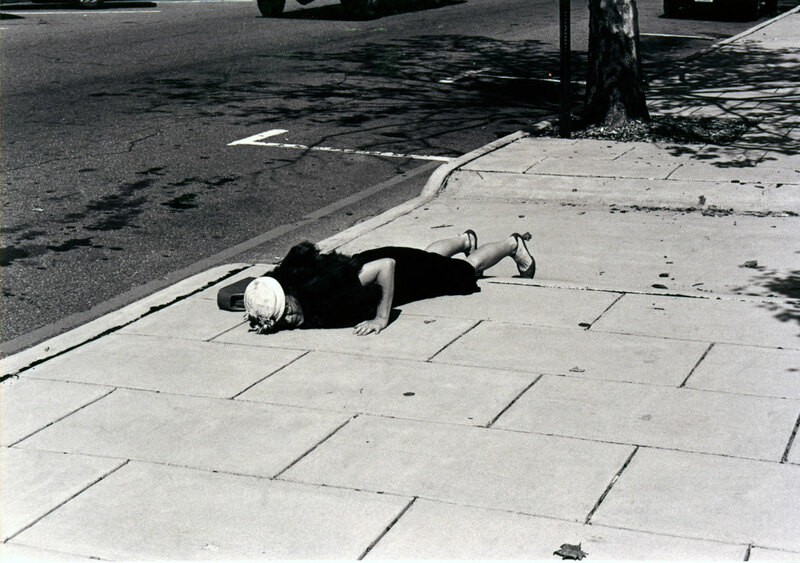 Julian decided more voices were needed, so he formed the Pedestrian Action League, affectionately calling it PAL. 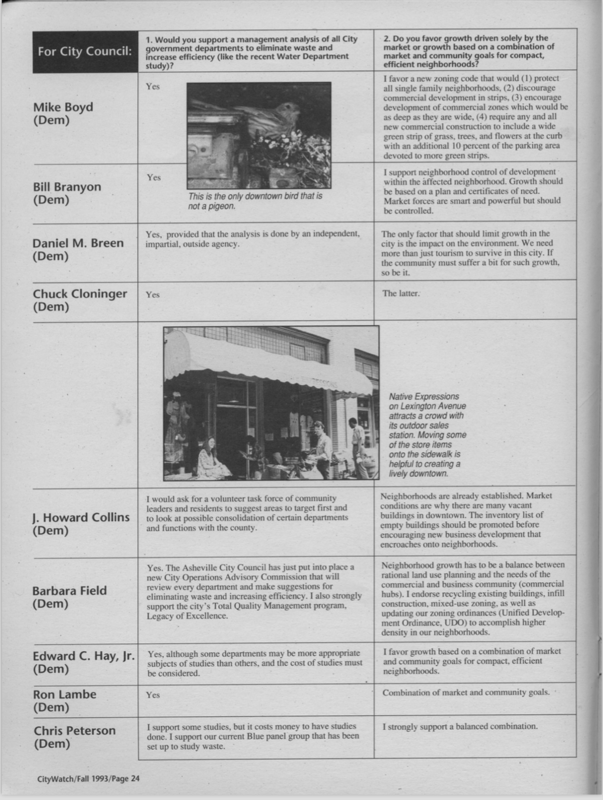 Though PAL was basically a one-man operation, Julian asked local shop owners and others he’d met through his walks around town to serve on its Advisory Board. Julian seemed like an affable, conscientious person who meant well, so they agreed. He created official looking PAL stationery which included all their names. 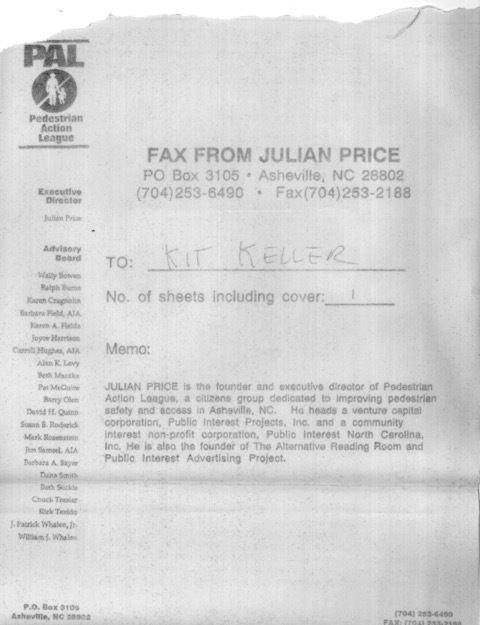 One day Kit Keller phoned Julian to ask if he would give a workshop to tell about PAL and his work in Asheville. She wanted him to be a presenter at the 12th International Pedestrian Conference in Maryland, October 1991! Julian was jubilant and felt renewed hope. He returned from that conference on fire. He developed a ‘guerilla media ad’ targeted to either embarrass or motivate Public Works Director Jim Ewing who had consistently ignored Julian’s requests. The ad worked. (see How to fight City Hall) That is, at one intersection, one traffic light–unfriendly for pedestrians–was corrected. But the lack of response elsewhere was deafening. Defeated, Julian faxed Doug’s letter to Monroe and then retreated to his room, closed the blinds and crawled into bed. It was few days of despairing reflection, peppered with encouragement from his friends. Slowly, strength and confidence seeped back into Julian’s skin. It came to him that to budge this city hall, it might take the whole community. Julian had been mulling over the idea to write and publish a magazine, and name it CityWatch. 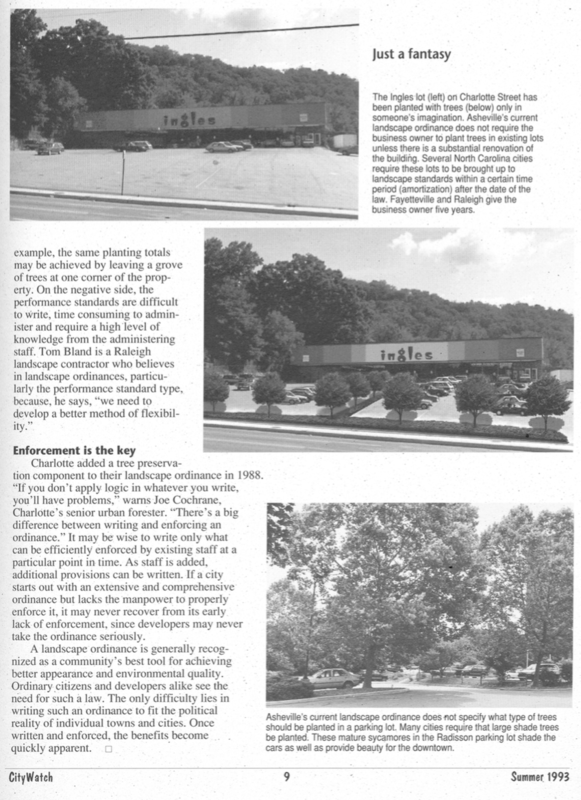 In the summer of 1992 his first issue was ready, and the staff at Jeff Fobes’ Mountain Xpress weekly distributed it. Julian included a short article about the win at Haywood St. and College, typically underplaying his own role. (see photo). 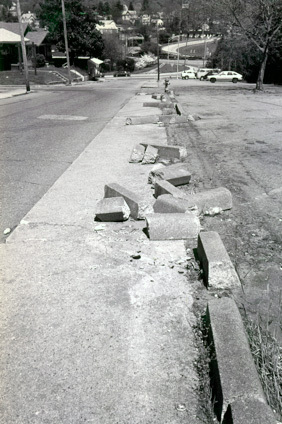 That issue also included a photo of a re-enactment of an accident on another street, due to the city’s improperly cut ramp. Julian asked readers to send in their experiences with city responsiveness or lack of it, and to tell about places in the city they wanted fixed. People enthusiastically responded with stories about problem places. Julian followed up on each of those, often going to meet the person at the problem place, armed with his camera and notepad. He was on a roll. A naturally gifted writer and photographer, Julian got a kick out of having a bigger audience to share about the “little” things he cared about. “God is in the details,” he’d say as he gleefully penned another CityWatch article about pigeon poop, billboards, graffiti, broken lights, barking dogs, tree care and more. Or he’d chuckle to himself as he thought of a funny caption for one of his photos. One day he came home beaming. 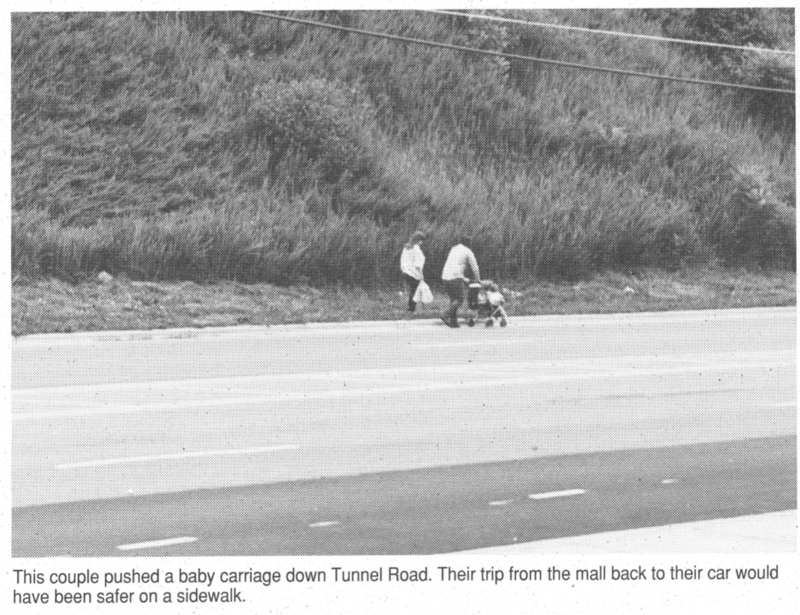 He’d happened to see and to photograph a couple with a baby trying to make it down busy Tunnel Road with no sidewalks. Now he could publish the couple’s plight to prove that people do want to walk! 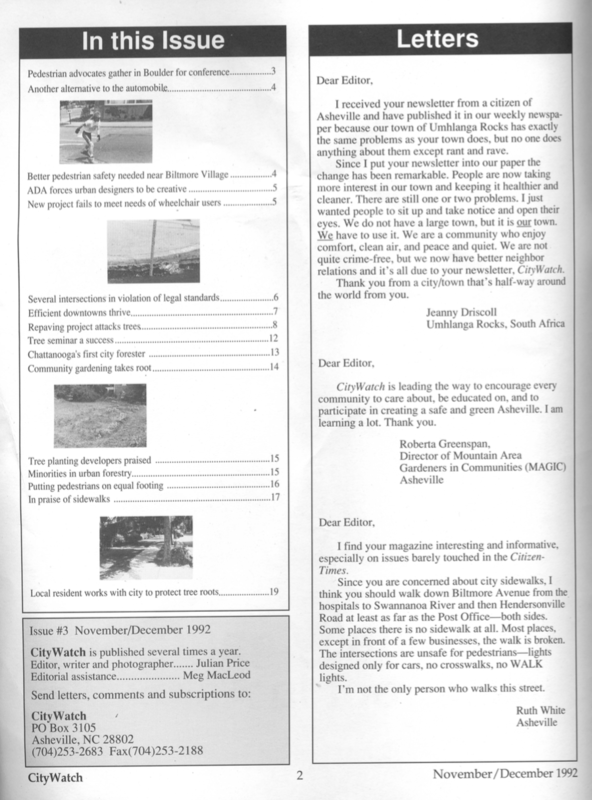 As interest in the magazine grew, Julian asked other people, including some of the staff at the Mountain Xpress to write articles for CityWatch. The collaboration between the two papers grew and soon a feature began appearing each week in the Xpress called Dysfunction Junction , showing yet another place not working well in the city. The spots were often contributed by a CityWatch reader and they got the credit, along with Julian’s droll captions. In the early part of CityWatch’s two-year run, Julian hired UNCA professor Mark West, to develop an unbiased survey measuring how locals felt about pedestrian and tree issues. He reported the results in CityWatch. 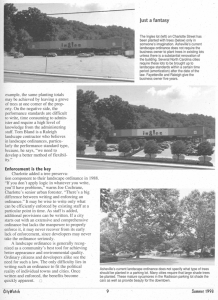 He later hired someone to computer-image trees in a treeless Ingle’s parking lot and put those in CityWatch. 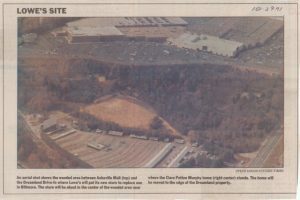 Then when Lowe’s threatened to remove trees for their expanded store on Tunnel Road, Julian hired a helicopter to get aerial views there and made those available to the Citizen-Tiimes. He hired expert arborists from out of town to walk that Lowe’s property with him. 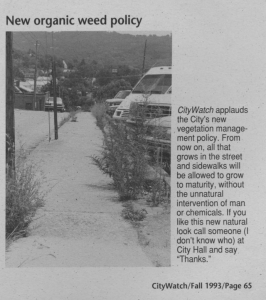 As always, Julian shared what he learned in CityWatch, plus took out ads in the Asheville Citizen Times newspaper. 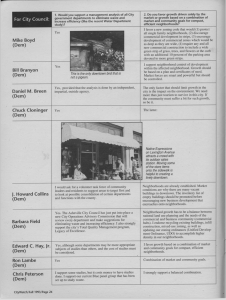 In those ads as well as in CityWatch, Julian invited readers to write letters to Lowe’s Chairman Robert Strickland – which they did. Within a few weeks, Lowe’s decided they didn’t need to cut down those trees. In the last few issues of CityWatch, Julian found more ways to have fun with it. 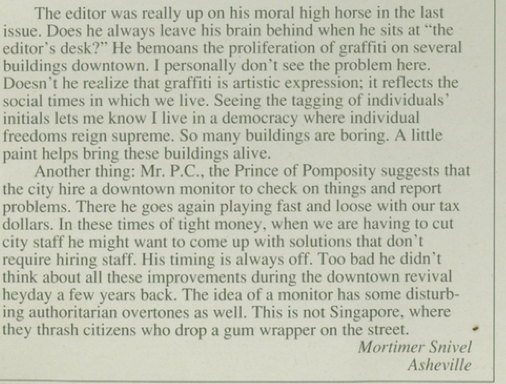 To balance out all the appreciative mail CityWatch received, he wrote a few growling letters to the editor himself, and signed them ‘Mortimer Snivel.’ Or he’d get someone to photograph him at a problem place, and put that in the magazine with a sly caption. CityWatch grew in popularity. But Julian was beginning to long for something else. Then, on a European trip with Meg to learn more about greening cities, Julian fell ill with pancreatis. As he lay in intensive care in German hospital for four weeks, letters and faxes poured in from those who loved CityWatch and appreciated what Julian had been doing. Pat Whalen even made the trip over to encourage him. They laughed together, and Julian slowly got better. By the last year of his life, Julian was playing golf openly, with people he felt at home with. And sometimes he’d even beat them! In the end, golf gave him self-acceptance, even as a man of inherited wealth. Who knows why things or people change? Julian saw what Asheville was not yet, but could become: a vibrant meeting place, safe and friendly for everyone. Like a court jester, he could be passionate, hilarious and profoundly serious at once. But he was a sensitive man who preferred to stay private and in the background. At times confident, creative and strong, he could also be, like the rest of us, fragile and lost. But still he found ways to ‘muddle through it’ as he would say, to kept going, to follow his dream and champion what he believed in. 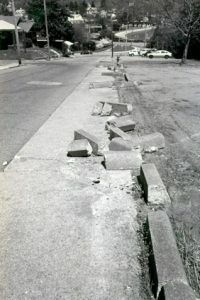 Toward the end of its two-year run, CityWatch had been recognized by both the Utne Reader and the Whole Earth Catalog. The eight CityWatch issues ranged from eight to 60 pages each. It became well-loved locally and elsewhere for its many photographs, tongue-in-cheek captions, and down-to-earth ideas about things that matter to everyday people who live in or visit cities.